A short stack of mugs in progress. 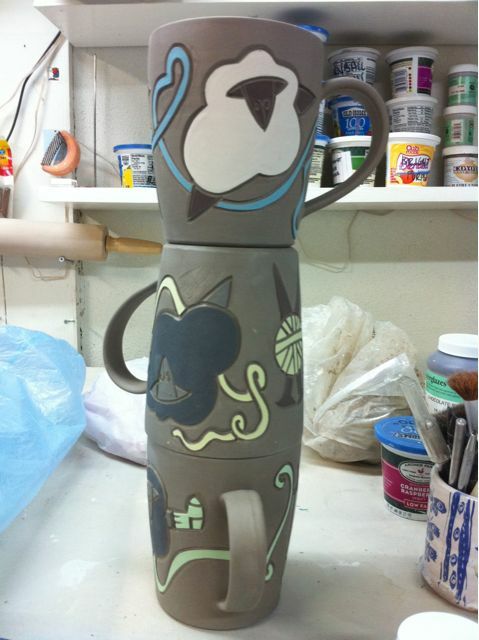 This entry was posted in Uncategorized and tagged in progress, pots, studio on September 29, 2010 by Jennie. Oooohh, Here’s to hoping I can snag one this time!! Nope. I hand pull each and every handle. It’s the way that works best for me. Also, there’s no space in the studio for an extruder! Come to me, my pretties!! Do they go on sale on Etsy nowadays? Is one of those sheep wearing socks? Brilliant! I bought a bowl of yours last year at NYSW and I can’t wait to get something new this year!